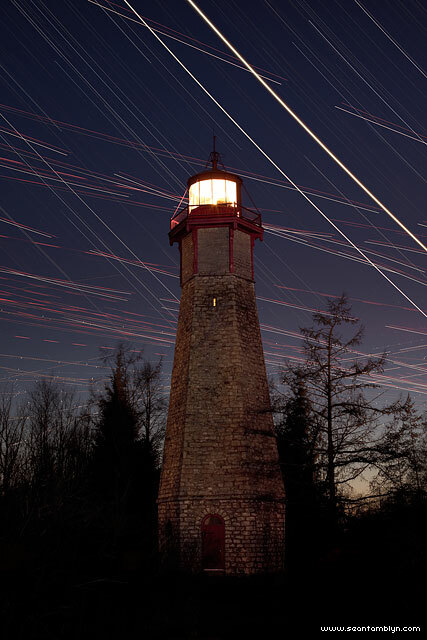 Venus and Jupiter streak past the Gibraltar Point lighthouse on the Toronto Islands during their conjunction of 2012, competing with star and aircraft trails from the nearby Toronto City Center Airport. The oldest remaining lighthouse on the Great Lakes, Gibraltar Point was constructed around 1808 and stands 82 feet tall. This entry was posted on Wednesday, May 2nd, 2012 at 7:12 pm. It is filed under Areas, Featured, Landscape, Star Trails and tagged with Canon EF 50mm f/1.4, Canon EOS 5DmkII, PClix LT. You can follow any responses to this entry through the RSS 2.0 feed.